By David Vallance, an intern in the Lowy Institute's International Security Program, and Euan Graham, Director of the International Security Program. The road to nuclear Armageddon is not straight. The North Korea crisis has led commentators to reassess the conventional wisdom that, when it comes to nuclear weapons, fewer is better. Unsurprisingly, South Korea and Japan are at the centre of this discussion. In a provocative piece in the Washington Post, Singapore’s Bilahari Kausikan recently made the case for nuclear proliferation (bar Taiwan) to stabilise the fractious region. At the other end of the spectrum, the Nobel Peace Prize-winning International Campaign to Abolish Nuclear Weapons maintain that the spread of nuclear weapons undermines international security. Both positions are missing something. Were Seoul or Tokyo to acquire nuclear-weapons capacity, abandoning their reliance on extended deterrence from the US, the region would not instantly become any more or less secure. Could South Korea go nuclear? In South Korea, the desire for nuclear armaments stems from the understandable desire for military parity with the North. Since Donald Trump was elected US president, after a campaign criticising freeloading allies, that desire has taken on a new urgency. While the South has deterred full-scale aggression by the North since 1953, it has had to restrain some of its more hawkish instincts to do so. Seoul tried to gain a nuclear capability covertly under President Park Chung-hee in the 1970s, has clashed repeatedly with the North at sea and across the DMZ. Even the current, left wing administration has been negotiating with the US to loosen restrictions on its ballistic missiles, while training 'decapitation teams' to infiltrate the north and kill its leadership. 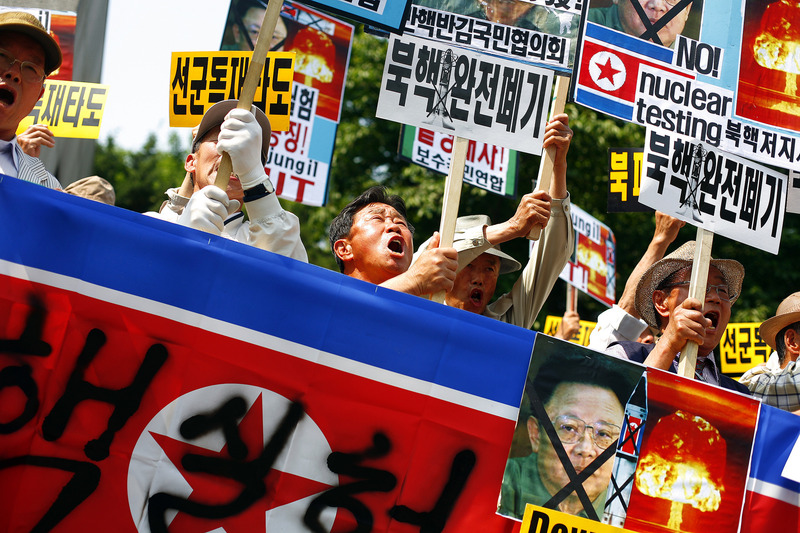 This mixture of heightened threat and longstanding rivalry is why South Korean media, the political opposition and some government officials have raised or backed the idea of nuclear parity with the North, either with their own arsenal or through the redeployment of US tactical nuclear weapons to the Peninsula. But for a number of reasons it would be difficult for South Korea to develop a nuclear arsenal. First, there is the constraining effect of agreements with the US and the Non-Proliferation Treaty. Then there are technical constraints. South Korea has 24 nuclear reactors, with nuclear energy providing about one-third of its electricity, but it lacks enrichment facilities to produce the fissile material needed for a weapon. In August, President Moon Jae-in announced the gradual phasing out of nuclear energy in South Korea, aiming to replace it with natural gas and renewables. In response to public pressure, he has since announced that two plants under construction will be completed by the early 2020s, but this will still leave Seoul’s nuclear ambitions further from being realised than they are today. Moreover, there is the risk to Seoul's relations with Beijing. China’s sustained opposition to America's deployment of THAAD missile-defence batteries in South Korea already indicates anxiety. Despite a strong trade relationship, relations between China and South Korea are strained, and moves towards acquiring nuclear weapons would strain them further. If a pro-nuclear president should take office in Seoul and reverse the nuclear energy reforms, Beijing's reaction would be swift and strong. South Korea’s interest in acquiring a nuclear capacity is parochial, since it is focused almost entirely on its northern neighbour. Beyond the goal of catching up with the North, those advocating for a South Korean nuclear weapons capacity have not thought through a nuclear strategy, including the flow-on effects beyond the Peninsula. But even if the situation on the Peninsula could be isloated from the region, the risk of low-intensity conventional conflict between Seoul and Pyongyang would not cease if both sides had nuclear weapons. In fact, they would become more fraught with danger. This is the so-called stability-instability paradox, whereby large conflicts are avoided out of the fear of mutually assured destruction, but limited conflicts are not similarly deterred. A proliferation of small conflicts can then undermine the supposedly stabilising architecture of nuclear security. What if Japan developed nuclear weapons? Conjecture about a nuclear-armed Japan happens more in the US than in Japan itself, unsurprising for the only country to have experienced the devastation of nuclear weapons. However, discussion has increased in Tokyo in light of the Korea crisis. Shigeru Ishiba, a former defence minister and potential successor to Shinzo Abe, has called for a more open debate on Japan’s non-nuclear stance. Japan is one of the few states without nuclear weapons to have an enrichment facility, and has a domestic stockpile of 10 tons of plutonium, with 37 tons stored overseas. Unlike South Korea, if the government desired, it could probably produce a device within a year. Japan would eventually be likely to develop submarine-launched ballistic missiles for a credible second-strike capability against North Korea and China. Bear in mind that the US alliance with the UK did not shatter when the latter developed nuclear arms, nor did the US abandon France in the face of de Gaulle’s nuclear force de frappe. Could Tokyo be a new London, and Seoul a new Paris? If we believe the structural realism of Kenneth Waltz, then the answer is 'yes'. However, Beijing and Tokyo are in conflict over broad questions of regional order and identity, as well as over territory. Kausikan points out that since Japan’s invasion of Chinese-aligned Korea in the 16th century, it has refused to be part of a Sino-centric order, and hence Tokyo needs a nuclear arsenal. But the opposite is true. Such weapons would in fact only intensify that historical rivalry. How much security would nuclear weapons buy for South Korea and Japan? Less than widely assumed. They would provide a guarantee against large-scale invasion, but little else. Flashpoints such as the Senkaku Islands could trigger armed conflict not quite serious enough to warrant a nuclear response, or we could see a brushfire conflict across the DMZ, or the western maritime border, against a nuclear backdrop. If this becomes a new norm, the implications for regional security are obvious. Though the likelihood and consequences of South Korea and Japan joining the nuclear weapons club are very different, one thing is true for the whole region: proliferation of nuclear weapons in Asia will not make the region more secure. At best, it is an expensive chimera; at worst, it will strike at the foundations of peace. The US Commander of the United Nations Command in South Korea, General Brooks, wants to 'revitalise' it.